In a bowl, mix the flour, milk, cornmeal, egg, baby food, parsley, and half the cheese. Using your hands, roll a few tablespoons of the dough into thin, 6-inch logs. Transfer the logs to the baking sheet. Twist each log a few times; sprinkle with the remaining cheese. Bake until crisp, about 40 minutes. Let cool. Preheat the oven to 375 degrees. Combine flour and baking powder in one medium sized bowl. Combine the milk and peanut butter in another bowl. Mix until the dough is blended enough that there aren’t a lot of lumps. Add the wet ingredients to the dry mixture and mix thoroughly. Spread a light layer of whole-wheat flour on a smooth clean work surface. Knead dough over top of your lightly floured surface. Spread out to about 1/4 of an inch thick using your rolling pin. Using cookie cutters, cut your shapes out and place the biscuits on the greased cookie sheet/pizza pan. Place in oven and cook for approximately 20 minutes or until a light brown (most noticeable on the bottom of the biscuit. When done carefully remove from oven and place on cooling rack, or set on a plate to cool. When cool put them in a bag or airtight container. 3. Tie a tight knot at the end. Although this toy may be simple, cats love them! My 17-year-old cat had accumulated many toys over the years and this toy was by far his favorite. This is another easy-to-make toy. Take a toilet paper or paper towel roll and cut into smaller pieces (cylinders) and place them on the floor for your kitty to play with. They can roll them, toss them up, and bat at them. Your kids can even use crayons to color them and make them look like animals. While it might be easier to run out to the pet store to purchase toys and treats for your pets or for shelter animals, making homemade treats and toys is a much more rewarding experience! Cosmo is a spunky and playful two-year-old male neutered cat who will be sure to provide hours of entertainment for his new family. His bright green eyes and loving disposition will make him a great addition to any home. 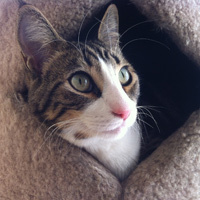 Cosmo is truly a special cat who is anxiously awaiting his forever home. For more information on adopting, visit the Santa Barbara Humane Society at 5399 Overpass Road, or call 805-964-4777. Shelter hours are Monday-Saturday, 10 a.m.-4:30 p.m.. You can also visit www.sbhumanesociety.org to check out more adoptable pets.